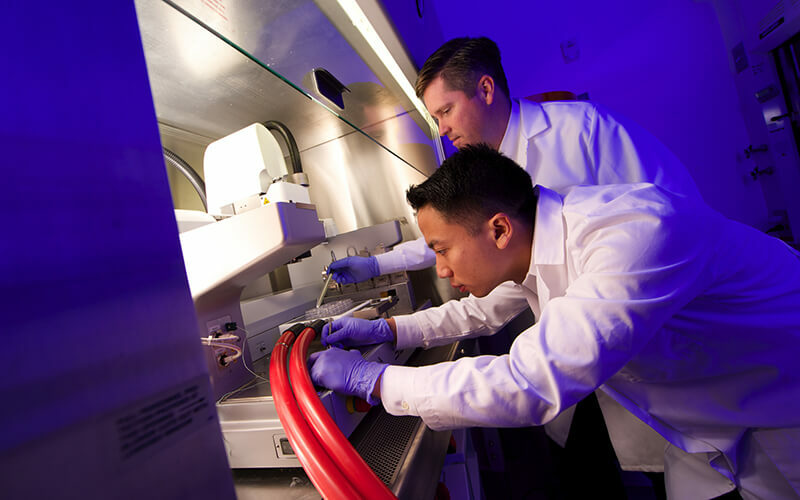 Opportunities for undergraduate and graduate students to participate in and lead research projects in BIOE are numerous and diverse, with major research programs in medical devices, drug delivery, biomolecular engineering, cell and tissue engineering, and more. Throughout their studies, undergraduate students have an opportunity to participate in research projects led by BIOE professors. Contact Bill Churma, associate director of academic and student affairs, for more information. First-year, sophomore, or junior-level students are also encouraged to explore formal, hands-on programs offered by the Clark School. ​The most common forms of support for graduate students interested in expanding research opportunities are fellowships and research assistantships. BIOE offers merit-based fellowships for current graduate students, made possible by generous donors. Additional opportunities are available through the Graduate School and organizations outside the University of Maryland. Contact your advisor or Rob Briber, associate dean for research, for assistance preparing a competitive application for fellowship programs outside BIOE. Students supported on Graduate Research Assistantships (GRA) participate in research projects funded by grants under the supervision of a faculty member. The project material is typically related to the student's thesis or dissertation. GRAs are awarded by individual faculty members. To inquire about opportunities, contact your technical division coordinator.